Today marks the eighth anniversary of the deadly earthquake that hit Haiti in January of 2010. 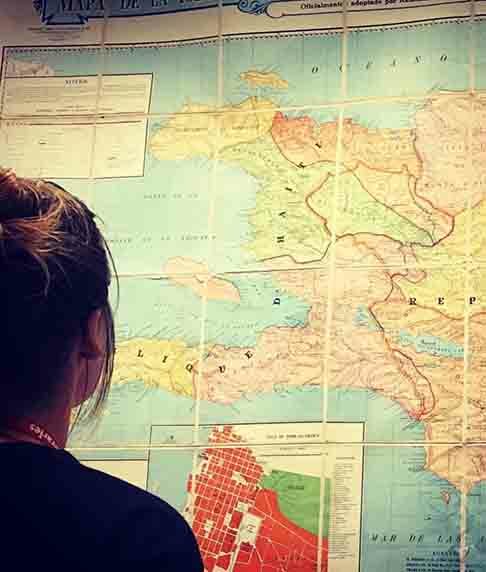 The Ball State University Libraries GIS Research and Map Collection (GRMC) includes a variety of maps of Haiti and the island of Hispaniola. Mapa de la Isla de Santo Domingo y Haiti por el General Cashmiro n de Moya (Map of Santo Domingo and Haiti by General Cashmiro de Moya) is displayed on the front wall of the GRMC (above, click to enlarge). The map was created by General Casimiro De Moya in 1905 and corresponds with the U.S. control of Dominican customs during Theodore Roosevelt’s presidency. De Moya was a politician and military leader in the Dominican Republic. This was the first detailed map of the island of Hispaniola. The GRMC also has a reproduction map of the island of Hispaniola published in 1722. The map depicts the topography of the island in color relief. 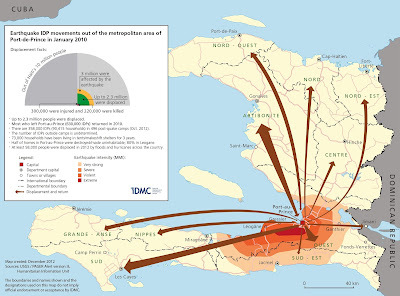 Hispaniola: Urban and Rural Population Map was published in 1956 and presents the population of Haiti and the Dominican Republic. 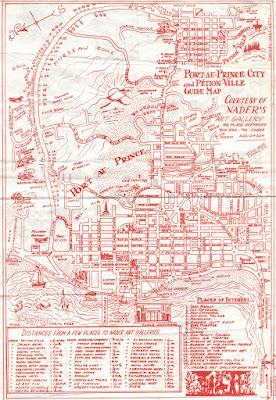 The map of Port-au-Prince and Petion-Ville, Haiti (above) is a guide map published in 1978. 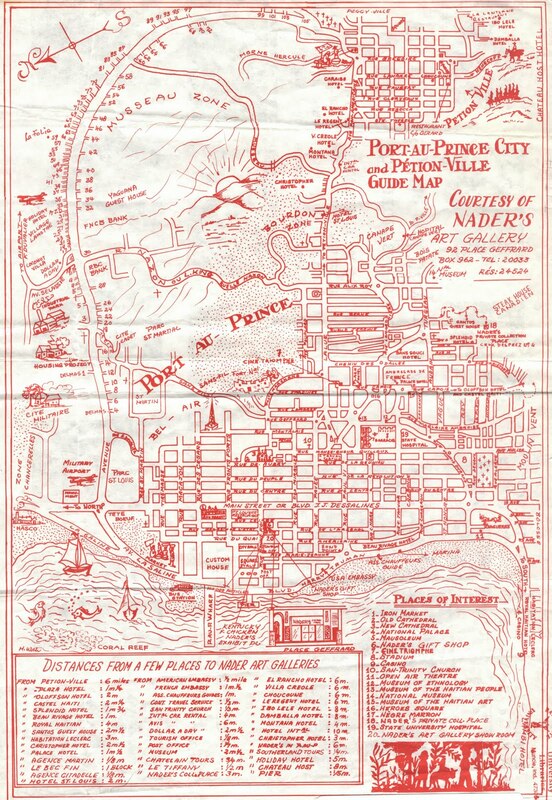 The map was created by the Nader Art Gallery in Port-au-Prince and includes the art of many different Haitians. It identifies points of interest like the U.S. Embassy, cathedrals, museums, theaters, and hotels with distances to the Nader Gallery show room. Nautical charts included in the GRMC also depict the coastline of Haiti. A large collection of maps and atlases of the Caribbean islands detail the larger area. Maps showing seismic activity in the region are also available in the GRMC. Maps related to the Haiti earthquake are also available in digital format from the GRMC. 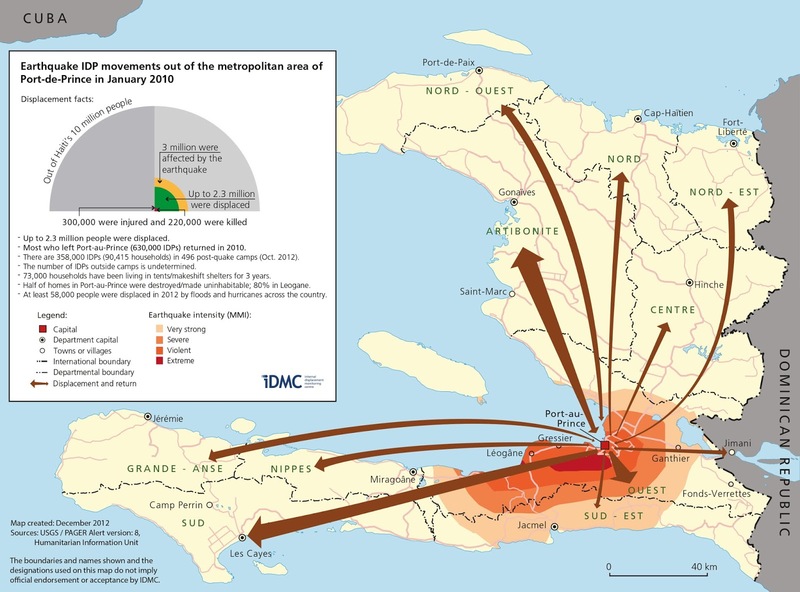 For example, the U.S. Geological Survey created the map showing the over two million displaced people in Haiti (above) and maintains a Web page related to the earthquake. Maps from the GRMC circulate for two weeks or longer. Please contact the GRMC at 765-285-1097 for more information.